Belize is a small country in Central America, bordered by Mexico, Guatemala and the Caribbean Sea. So, for a small country, what is there to love? A lot! Here, you can find ancient structures, nature, and otherworldly blue waters that you wonÂt believe are real. 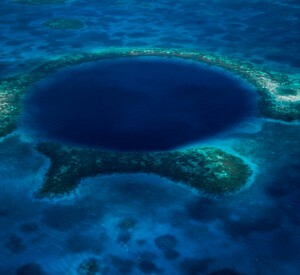 Oh, and did I mention that the Great Blue Hole is found in this country? One of their official languages is English Â many thanks to their history (Belize is a part of the British Commonwealth), you wonÂt have to worry about language barriers much while you are on your trip. ItÂs also a plus if you have an EU, US, or UK passport then it shouldnÂt be a problem to get into the country without worrying about a visa. Brilliant, right? Oh, and since the country is a bit small, you can easily rent a car or hop on a boat to visit other towns and places that are on your list. Made famous by Jacques Cousteau, this is the largest sea hole in the world (think sinkhole, except filled with water) and youÂve probably seen this place on TV or read about it on travel magazines or blogs at one point in time. It sure was one reason why I wanted to go to Belize in the first place. This is a scuba divers paradise, and is listed as a UNESCO World Heritage Site (if youÂre on a quest to go to most, if not all of the sites, then this is another tick off your list). HavenÂt had enough of the Great Blue Hole? Well, with BelizeÂs numerous Atolls, you can find yourself snorkelling and diving some more to see sea life in all its glory. Tired from all your water pursuits, you can hide away in one of the resorts or find yourself in a deserted island as you charter a boat tour. Fishing frenzy? You can do your fair share too. Best to just get to one atoll then find a place to stay, rent a kayak and go. Its flip flop weather year round and the Âno shirts, no shoes, no problemÂ attitude is readily available here. May I suggest a visit at the world famous Ambergris Caye? There is only one town on the island (San Pedro) and is still a mostly virgin island. They have their fair share of Mayan temples, the most famous of which is Caracol, found in the West of the country near the Guatemalan border. These temples are not as well-known as say Chichen Itza or Tikal, but they are worth seeing too. They are at risk of being destroyed (the rocks are used to build roads) so best to see them as soon as you can! For a small country, they have their fair share of nature preserves for the nature lovers out there. Home to the worldÂs only Jaguar Preserve (Cockscomb Basin Wildlife Sanctuary), you can spend hours hiking around these protected areas and looking at the various flora and fauna that they have to offer. The cost of living in Belize is substantially lower than most countries in the world. Rent is very low, and you can hire someone to help clean your house or run your errands for you. With all of these great reasons, what are you waiting for?! Enjoy Belize and what it has to offer!